My adventures in creating beautiful and delicious gluten free food. Recipes, Tips and Tutorials for the home cook, from a home cook. When I first made the decision to cut out the wheat, I took a trip to a fancy health-food store that is known for its fresh baked goods, many of which are GF. If you have looked at GF products at any grocery store than I'm sure you have realized that they are about 3x the price of their gluten-full equivalent, so they better be good right? That day I purchased several individually wrapped muffins, cookies and a loaf of bread and hoped for the best. I realized right away that there was something amiss when the cookie I had purchased didn't even make it home in one piece (it had crumbled into sand). Upon tasting the crumbs, my suspicions were confirmed; the cookie was crumbly, dry and bland. I knew I could do better. 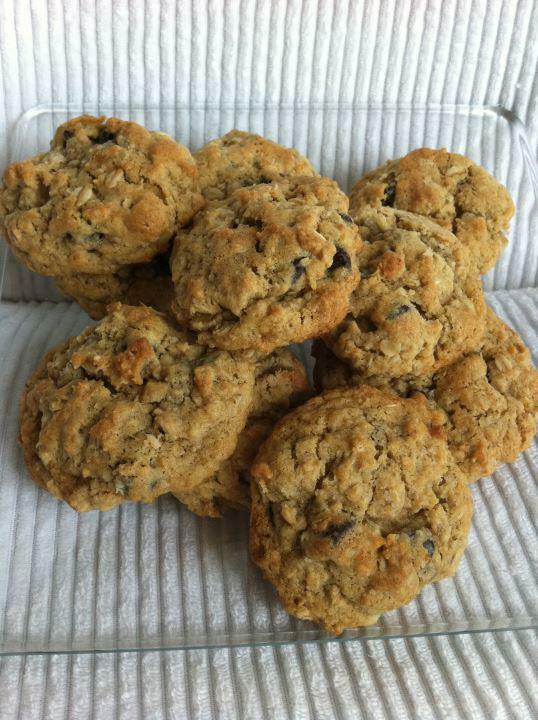 Whether you've been baking gluten free for years or this is your very first time, one thing is for sure: Everyone loves a really delicious cookie. 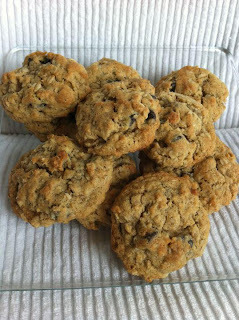 I adapted my "Chocolate Oat Chews" from a basic Oatmeal Chocolate Chip cookie recipe that I've been using for years as my first attempt at GF baking . 2. Cream the butter and sugar together. This is very easy when the butter is at room temperature and can be done very easily by hand or with the paddle attachment of your stand mixer on a low/medium speed. 3. Add the eggs and vanilla. Mix to combine. 4. In a separate bowl, mix your dry ingredients (GF "all purpose" mix, oat flour, oats, baking powder, baking soda and salt). I often do this with a whisk. 5. Mix dry ingredients into wet ingredients in 3 additions being sure to only mix until combined (over mixing when it comes to any kind of baking results in overworked "tough" baked goods. 6. Stir in chocolate chips (again, mix only enough to get them somewhat evenly distributed throughout the dough). This should be your result: delicious, sticky, hearty dough. 7. Roll cookies into balls and place on lined cookie sheet. Consider putting them into the freezer for 10 mins (see Tip #1). Remember that at this stage you also have the option to save some dough for baking later (see Tip #2). Tip #1: I like my cookies to be thick and chewy. In order to achieve this I roll my dough into balls (slightly smaller than a golf ball) and place them on my cookie sheet (covered in parchment or a non-stick silicone mat). Next I put the whole thing in the freezer for about 10 minutes to chill. This will prevent the cookies from spreading out too much in the oven and will give you a nice moist center while still having a crispy base and edges! If, like me, you live alone and don’t really want 30 cookies hanging around your house all at once to either go bad or (more likely) be eaten all at once, there is a simple solution! Roll all your cookies into balls like usual but leave the ones you want to store for another day in the freezer for about 2 hours. Once completely hardened, you can simply pop them into a freezer bag and return to the freezer for up to 2 months. To bake, place a few balls of frozen dough on a lined baking sheet and allow to thaw while your oven preheats (10-15 minutes) then bake for about 12 minutes for fresh cookies any time! Be sure to vote for the recipe you would like to see next at the top right corner of the page! Also I would love to hear about how this recipe worked in your kitchen so please leave me feedback in the comments section below. What would you like to see next on Gluten Free Kitchen Adventures?